Thanks to the efforts of Gram’s daughter, Polly Parsons via The Gram Parsons Foundation, supporters and fans now have an online destination for everything Gram Parsons; from music to photographs, from videos to social networking. 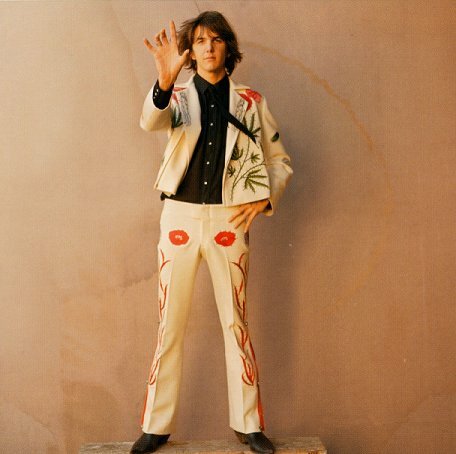 Due to an overwhelming demand, The Gram Parsons Official Website (www.gramparsons.com) was set up to honor Gram, often noted as the pioneer of “country rock,” as an iconic musical trailblazer. The Gram Parsons Foundation has the great pleasure of introducing an online community where people can share stories, photos and knowledge about this legendary musician. This is a fan resource as much as a tribute, offering tribute concert and fan gathering updates and to-the-moment Twitter and RSS Feeds. The demand created by the current musical community will allow fans of Gram to gather and discuss everything from the new Emmylou Harris record (Hard Bargain) and her song about Gram (“The Road”), to indie bands like Blitzen Trapper, Fleet Foxes, Dawes and Mumford & Sons, who have all cited influences by or have garnered some press comparisons to Gram. The site’s home page features the live RSS and Twitter feeds, documenting the constant activity about Gram, as well as hosting Gram TV, which is currently “playing” a clip reel from the 2004 tribute concerts which featured Keith Richards, Norah Jones, Lucinda Williams, Dwight Yoakum and others. The foundation’s goal for Gram TV is to update content to feature the up and coming artists who are inspired by Gram’s music. The site also features a music page, streaming songs and lyrics from Sweetheart of the Rodeo (The Byrds), Safe at Home (The International Submarine Band), Gilded Palace of Sin and Burrito Deluxe (The Flying Burrito Brothers), and the solo albums GP and Return of the Grievous Angel. 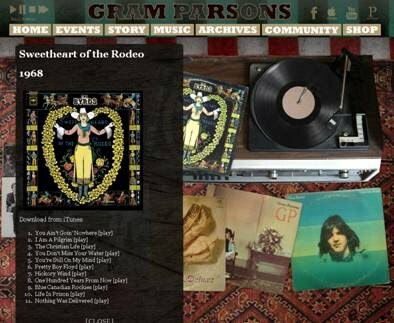 The archive tab for The Official Gram Parsons Website opens a treasure trove of online content, ranging from videos hosted on the Gram Parsons Official YouTube channel, streaming interviews with Gram, Gram Parsons quotes, articles and photographs. There will soon be an online store with Official Gram Parsons merchandise along with a “gift” to all the long standing fans in time to mark what would have been Gram’s sixty-fifth birthday on November 5. The mission of The Gram Parsons Foundation is to support musicians and artists from around the world with addiction and recovery services. The foundation’s dedication to helping those with substance abuse issues is further shown at Polly Parsons’ Hickory Wind Ranch, the premiere sober living homes for men and women in Austin, TX. It was only natural that Polly was driven to provide support and a nurturing environment by helping other members of the artistic community in need – a full circle moment. The goal of Hickory Wind Ranch is to help every member of their community learn how to live a full and rich sober life and to achieve physical, emotional and spiritual balance. Hickory Wind Ranch is proud to share their gift to the community through their involvement with A&E’s Intervention.